Thank you to Corelyn for the photo! I wanted to create a honey almond brittle, and flavors such as oranges and cherries go well with honey and almonds. The cake is a basic gluten free sponge cake infused with orange juice and zest. The fruit filling is macerated cherries that soaked in wine for half a day. Finally, the brittle is a simple brittle made with honey and almonds. 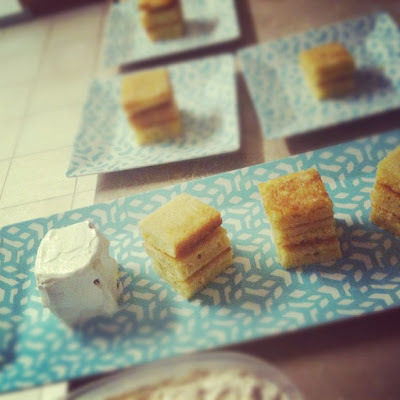 I hope you enjoy this recipe, and congrats to Mary and Zak! Spread the almonds out onto a sheet, and toast for about 5 minutes. Chop the almonds. In a small saucepan, boil the sugar, honey, and water until mix hits 300F, stirring constantly. Once the mix hits 300F, remove from heat and stir in the butter and almonds. Spread the brittle onto a silicone mat, as thin as possible. After about 3 minutes, cut the brittle into thin strips for the rotor blades. Let them cool to room temperature, then store in the refrigerator until firm. Preheat oven to 350F. Line a rectangle baking sheet with parchment paper. In a medium bowl, whisk egg, sugar, salt, juice, zest, and vanilla for about 4 minutes. Fold in the powder, starch, and flours. Once combined fold in the butter. Pour into the prepared pan, and bake for 30 minutes or until an inserted toothpick comes out clean. Pit the cherries and cut into quarters. Place all the ingredients into a small saucepan, and combine. Let sit for 2 hours. Over medium heat, cook the cherries for 15 minutes, stirring occasionally. Blend the cherries into a jam with an immersion blender. Cut the cake into 2 inch squares. Group the cakes into groups of 3. Place the first layer onto a place, and then spoon filling onto first layer. Add a second layer and add another spoon of filling. Top with a third cake. 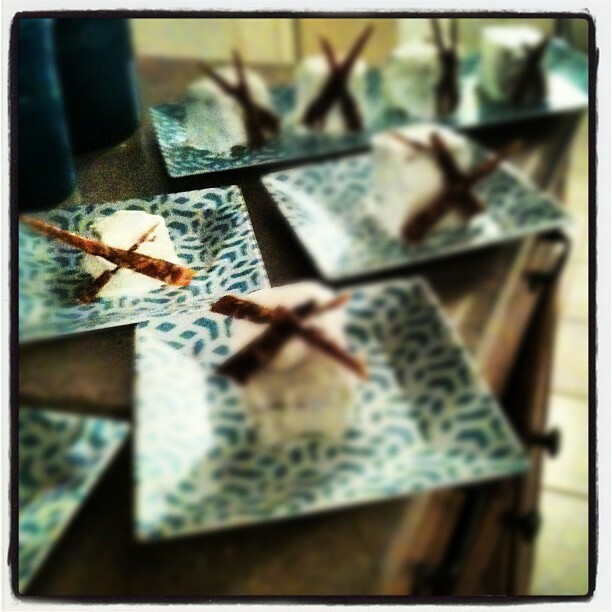 Ice the cake with whipped cream, and cross two brittle strips in the shape of a windmill.